Attractive Former Farmhouse with Attached Modern Self Contained Single Story Annex. Enjoying Much Privacy, Set Within a Fully Landscaped Plot of Approx 0.9 Acres. Stunning Panoramic Countryside - Distant Sea Views Across the Fields Beyond. House Renovated Over the Years by the Current Owner Retaining Much Charm & Character. In Brief, Spacious Lounge with Large Stove & Adjacent Study/ Sitting Room. Cloakroom WC. Large Farmhouse Kitchen with Appliances, Utility Room & Boot Room. OFCH & D/Glazing. Spacious Annex Circa 2007 with a Separate uPVC Conservatory Linking to the Main House. Designed with Full Disabled Access & Facilities Including Pull Cord Alarm System to House. 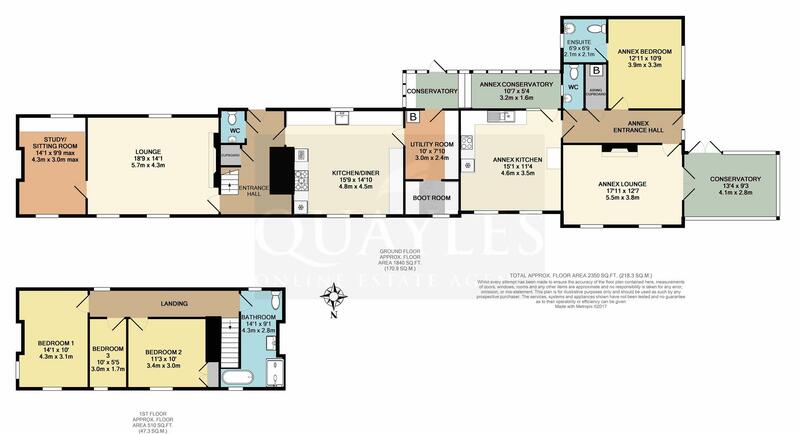 Lounge & Conservatory, Dining Kitchen, Double Bedroom with E/S Wet Room & Guest WC. O/F Underfloor Heating, D/ Glazing & Access to Garden & Seating Area Enjoying Sunset Views. Potential for Use as Staff/ Guest Accommodation, Home Office, Luxury Holiday Let or Studio. Parking Area, Landscaped Walkways, Vegetable & Fruit Beds, Hen House, Kennels & Sheds. Private Picnic Area & Large Spring Fed Pond with Resident Ducks - A Beautifully Tranquil Retreat. From Parliament Square travel out of Ramsey on the Lezayre Road. On reaching Sulby continue along turning left just prior to the Ginger Hall Public House, onto Ballamanaugh Road which runs directly behind the pub. Continue along taking a left hand turn at the T junction. Follow the road along and turn right onto the single track lane with the nameplate 'Carrick House'. Continue for a short distance up this lane where the property with be found on the left, being clearly identified by our For Sale board. NB the lane is owned by the Ballamanaugh Estate. It widens by the house and continues through a gate to private farmland although the owners of Carrick House have access rights to the property at all times. Carrick House enjoys stunning panoramic views from its elevated position above the Ballamanaugh dairy farm. It has unobstructed views from the west side to the north east, capturing the whole of the north of the island with distant sea views to the Scottish hills beyond. TT enthusiasts will be pleased to note that the property offers easy access to popular viewing locations at Sulby and the Ginger Hall. The area also offers fantastic opportunities for walkers and mountain bikers to enjoy the countryside. property. Ceramic tiled flooring. A wood grain effect uPVC double glazed door provides access to the rear garden and extensive decked area. Latch doors to the lounge, cloakroom WC & kitchen. Fitted with a modern classic white hand basin with chrome period style fittings and a matching WC. Ceramic tiled floor. A spacious, dual aspect room with two deep set uPVC sliding sash windows to the front providing distant views, and one to the rear. Beamed ceiling. Manx stone 'Chiollagh' style fireplace with a large recessed 'Stovax' 'Regency' cast iron multi-fuel stove set on a slate hearth. Oak plank effect floor covering. Two wall and picture lights. Illuminated alcove with display shelving. Smoke detector and carbon monoxide meter. Telephone point. 5 amp lighting circuit. A half obscure glazed door leads into the study/sitting room. A dual aspect room again enjoying the views via a uPVC sash style front window. Featuring an inset cast iron stove with an exposed stone lintel above. Currently presented as a study with a built in two person work station but equally suitable for use as a sitting room or playroom. Oak effect flooring. Coved ceiling with recessed down lights. A naturally bright and spacious room with ample space for a large dining table and chairs. Two uPVC double glazed sliding sash windows provide countryside views whilst a further uPVC window looks out across the rear garden. Fitted with an excellent range of country style cream coloured wall, base, drawer and pan units together with two wall mounted crockery units and a larder unit. Additional fitted Welsh dresser style units with two illuminated display cabinets, plate rack, pan drawer, three base units, additional shelving and open units with two pull out baskets. Solid wood block work surfaces incorporate a 'Belfast' sink with a chrome mixer tap and spray. ''Neff' built in electric double oven. 'Belling' five burner stainless steel gas hob with a 'Zanussi' stainless steel extractor above. Integrated 'Whirlpool' fridge. Background tiling and counter lighting. Recessed down lights. Smoke detector. Ceramic tiled flooring. A half glazed hardwood stable style door leads through to the utility room. dishwasher. Space for a chest freezer. Tiled floor. Heated towel rail. 'Worcester Bosch' oil fired central heating boiler installed 2017. Access to an insulated and fully boarded loft. A half glazed hardwood stable style door provides access to the rear conservatory. A second doorway leads to a 'boot room' which provides a useful storage space with shelving, coat hooks and a uPVC sliding sash style front window for natural light and ventilation. Of uPVC construction on a low wall base with a polycarbonate roof. Built in bench/store. Tiled floor. Naturally separated into two areas with a door leading out to the rear deck and steps down to the lower level which has a lockable, interlinking door to the annexe accommodation and is plumbed for a washing machine and dishwasher with a worksurface above. A further uPVC door accesses the rear of the property and pathway to a private seating area adjacent to the main annex conservatory. NB It may be possible to separate the two levels for complete privacy if required. A wide hall with two fitted wall lights. Double glazed window to the rear elevation. Power point and smoke detector. Coved ceiling. An L shaped room fitted with a classic white suite comprising traditional cast iron roll top bath, WC, pedestal basin and a fully tiled double width enclosure with glazed doors fitted with a chrome shower unit and over head rose. A rear uPVC window provides light and ventilation whilst the front window provides stunning views from the bath. Wood effect floor covering. Coved ceiling with recessed down lights. Extractor. Wall mounted heated towel rail. Enjoying the countryside views via a deep set uPVC sash style window. Recessed, built in double wardrobe. Coved ceiling. 5 amp lighting circuit and telephone point. A generous single room again enjoying the views. Oak effect floor covering. Access via a pull down ladder to an insulated and boarded loft with light and power. Coved ceiling with a spotlight fitting. High level television point. Wall mirror. A well proportioned, dual aspect room with two uPVC double glazed windows providing countryside views. Oak effect floor covering. Coved ceiling. Telephone point and high level television point. Added in 2007 by the current owners. Of cavity construction with oil fired underfloor heating. Quality oak effect laminate floor covering has been installed throughout with the exception of the kitchen and wet room. A spacious property which has been designed for ease of access by wheelchair users. 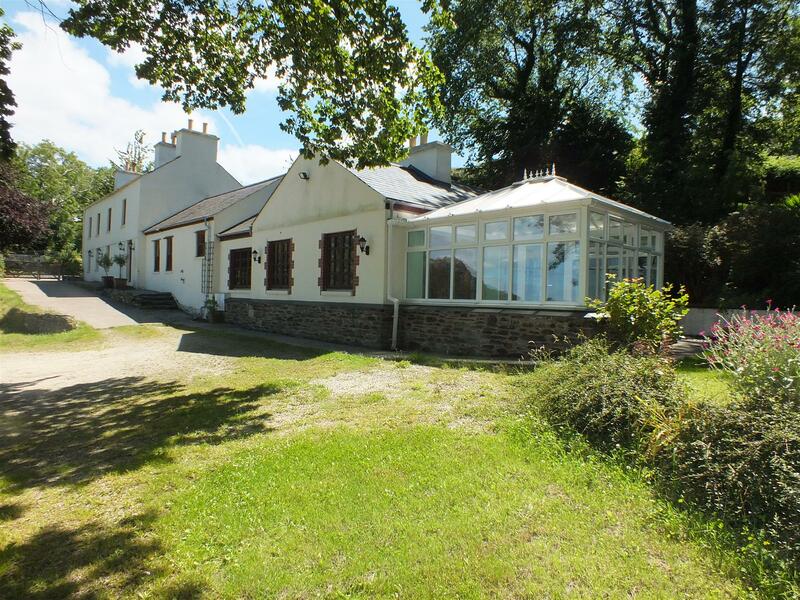 Perfect for use as a 'Granny Annex' although planning permission has been granted for either or both of the properties to be used as holiday lets which makes them ideal for personal or commercial use. The annex itself is offered in excellent condition and enjoys the same frontal views as the house in addition to stunning sunset views from the lounge and conservatory. A hardwood door with a double glazed panel accesses the property from the side and leads into the entrance hall with a coved ceiling and access to an insulated loft. A deep built in storage cupboard houses an oil fired boiler with a pressurised cylinder and the underfloor heating manifolds, heating controls and consumer unit. Smoke detector. Power points. A spacious double room with a hardwood double glazed window enjoying a pleasant outlook over the garden. Ample space for free standing furniture. Coved ceiling. Telephone point and high level television point. Alarm pull cord. Door to the en suite wet room. Fitted with a white pedestal basin and WC. Primarily tiled walls and slip resistant flooring with inset drain. Open shower area with hand rail and drench style fixed overhead rose. Two mirror fronted vanity units. Recessed downlights. Obscured, double glazed timber framed window. Alarm pull cord. A superb, naturally bright room with dual hardwood double glazed windows to the front providing countryside views across the dairy to the hills beyond. Featuring a brick fireplace with a tiled hearth and concealed power point suitable for an electric 'stove style' heater. Coved ceiling. Television and satellite points. 5 amp lighting circuit. Alarm pull cord. A pair of glazed multi pane doors lead into the conservatory. Of uPVC construction on a low wall base with a hipped polycarbonate roof. A pair of uPVC double glazed double doors provide access to the lower level west garden. 5 amp lighting circuit. Fitted with a modern white suite comprising WC and hand basin with period style chrome taps. Side window. Coved ceiling. Extractor fan. Enjoying far reaching views from the spacious dining area via a large timber framed, double glazed window. Television and telephone points. The rear of the room is fitted with an excellent range of cream coloured shaker style wall and drawer line base units, one incorporating a large pull out larder rack unit and a push control carousel corner unit. Solid Beech block work surfaces incorporate a 'Villeroy & Boch' ceramic 1 1/4 bowl sink with a chrome mixer tap and an additional solid wood chopping board. Inset four ring gas burner with a built in 'Hotpoint' electric double oven beneath and a stainless steel extractor above. Integrated fridge. Background tiling. Coved ceiling with recessed down lights. Tile effect floor covering. Lockable door providing access to the interlinking conservatory. Alarm pull cord. picturesque countryside views across the north of the Island from an elevated position. To the rear of the property is a south facing deck and lawn which is ideal for 'Al Fresco' dining, being incredibly sheltered. There is an upper lawned area with a shingle pathway which leads up and around the perimeter of the property with sapling fruit trees and raised beds. The steps continue past a private picnic area and down to the west garden featuring lawns to two levels. En route is a large spring fed pond with resident ducks, a tranquil spot if ever there was one! There are mature deciduous trees and further seating areas - one of which is perfectly placed to enjoy the sunsets. Outside water tap. A bunded polyethylene oil storage tank serves both properties. To the east side of the grounds there are two large sheds, having light and power points on their own consumer units. There is also the potential for kennels or hen housing with fenced compounds already in place. The whole of the east garden is illuminated by 'Metal Halide' flood lighting. A large area with slate chipping makes an ideal spot for morning coffee. Mains electricity & water. Shared drainage and oil tank. Separate oil fired boilers to house and annex. Both properties benefit from uPVC double glazing.